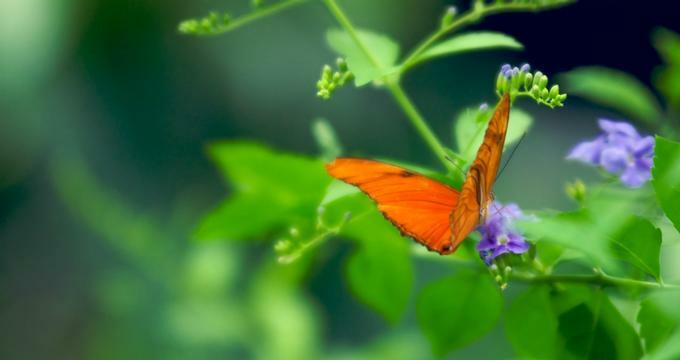 Explore a glass enclosed, climate controlled habitat filled with 50-60 different species of butterflies, 30 species of exotic birds, tropical foliage and water falls at The Key West Butterfly and Nature Conservatory in Key West, FL. The Butterfly and Nature Conservatory is made up of three parts, the Conservatory, Learning Center, and Gallery. 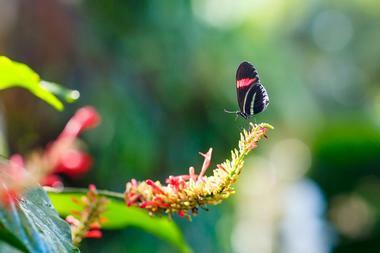 The Conservatory is where the butterflies and live plants are housed and considered the main attraction. This area is very warm and kept at 85 degrees with 80% humidity. Visitors can stroll through tropical flora and waterfalls, view anywhere from 50-60 different butterfly species and relax on benches and watch the serene views. All of the butterflies in the conservatory come from tropical butterfly farms where they are bred in captivity where they are sent to the conservatory when they are in the chrysalis stage. 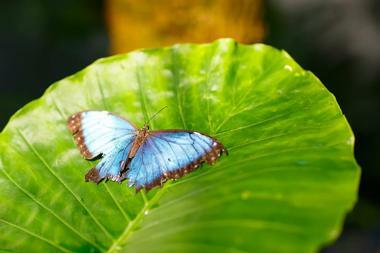 The largest butterflies in the conservatory are the Owl butterflies that can reach a wingspan of 11 inches. None of the butterflies in the conservatory can bite or sting and while most butterflies only live about 10 days, those in the conservatory can live as long as 3 months. Most of the butterflies feed on pollen and flower nectar but there are also feeding stations set up that allow the insects to feed on rotting fruit and refuse as well. Visitors will also be able to see the Atlas moth when in season, with a wing span of up to 12 inches, making it the largest in the world. 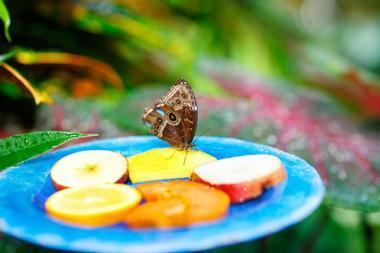 The Learning Center is where visitors can learn everything there is to know about the life cycle of the butterfly. Guests begin with a 15 minute introductory movie that goes over the butterfly life cycle and interesting facts about the insects. There are also murals, identification maps, migratory maps, illustrations on butterfly anatomy, and interactive displays on monarchs and other butterflies that visitors can explore. Visitors can also glimpse a rare close up view of the life of a caterpillar. Guests can watch caterpillars munching away on their host plants, forming chrysalis, and transforming into butterflies in the butterfly nurseries. The Gallery, Wings of Imagination has been operated by artist San Trophia for over 30 years and has helped the butterflies achieve immortality in a unique way. Instead of taking paint or pen to paper, Sam captures the butterflies after death in airtight acrylic cases to be displayed on walls or display cases. Many of the butterflies are displayed as though suspended in flight and show a wide range of color, size, patterns and brilliance. The mounts can be anywhere from a single butterfly to an entire wall mural with every piece being completely unique. No two pieces of art work in the gallery are the same. All of the butterflies used in the art lived out their life cycles in the Butterfly conservatory and were farmed from South America, Africa or South East Asia. The Gallery can be visited in person or online through the website. Custom orders and commissions are also available. The Key West Butterfly and Nature Conservatory is proud to offer group tours for groups of ten or more and has options for educational program tailored for specific grade levels if interested in field trips. Groups tours must be scheduled in advance and discounts are available. Wedding ceremonies are very popular in the conservatory and are private. The event takes place after the conservatory has closed to the public so you don’t have to worry about party crashers or unwanted guests. The ideal guest count is 20 as the gazebo is small and seating is limited. If you prefer your guests to stand for a short ceremony, up to 50 guests can be accommodated. In addition to the Gallery, Wings of Imagination, there is an extensive gift shop at the Conservatory full of nature and butterfly themed art, jewelry, gifts and collectibles. The gift shop can ship your purchases nearly anywhere and purchases can be made online as well for the most popular items such as books, jewelry, key chains, apparel, garden and holiday items.